Samsung officially announced the smartphones Galaxy A3, Galaxy A5 and Galaxy A7 a year ago, less than a year after the debut of the original series launched in 2015, and since then remains very popular among consumers; so much so that the series will continue for another year. A few weeks ago we began to leak the first details thanks to some benchmarks and now we have a list almost complete with the specifications of the three models: Galaxy A3 (2017), Galaxy A5 (2017) and Galaxy A7 (2017). To these three smartphones, the Galaxy C9 (2017) has also recently been added. On October 17, we learned about the Wi-Fi certification of Galaxy A5 (2017). On November 18, 2016, all three cell phones received Bluetooth certification. On December 7 we got the first images of the alleged Galaxy A7 (2017). And since December 23, the first firmware for the Galaxy A5 (2017) is available for download from the SamMobile database, a good indication that the device is about to be announced. Along with the firmware, eight default system wallpapers, which are expected to be present in the entire series, are also available. The Samsung Galaxy A5 (2017), based on the information available to date, comes with Android 6.0.1 Marshmallow, Super AMOLED screen of 5.2 inches with Full HD resolution protected by curved glass 2.5D, a processor Exynos 7870 or 7880, 3 GB of RAM, and 16 GB of memory. The Galaxy A5 (2017) will be available in four colors -black, blue, gold and pink- and the front and rear cameras would have 16 megapixels with a f/1.9 aperture and a non-removable 3,000 mAh battery. 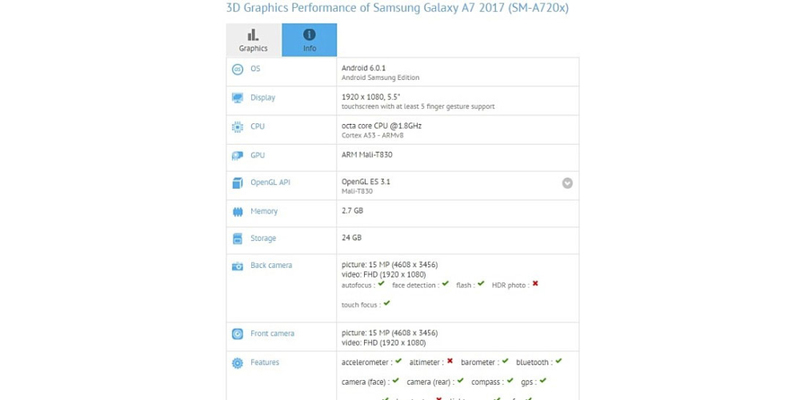 The Samsung Galaxy A7 (2017) will feature a 5.7-inch Super AMOLED display with Full HD 1080p resolution, Exynos 7880 chipset with 3 GB of RAM, 32 GB or 64 GB storage with micro SD memory card slot, and 3,500 mAh or 3,600 mAh battery. Both front and rear cameras will be 16 megapixel resolution, although the main sensor will have a wider focal aperture of f/1.9. Other specifications include a fingerprint reader, USB-C port and IP68 certification for water and dust resistance. 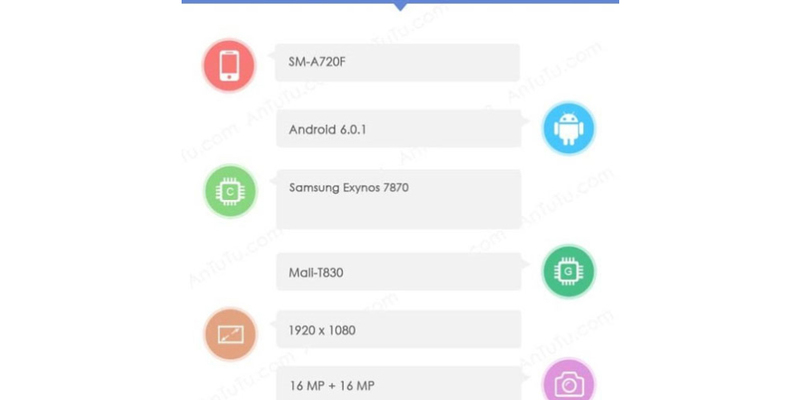 On November 18, the Galaxy A7 (2017) SM-A720F received Bluetooth certification. The third smartphone in the series, the Samsung Galaxy A3 (2017), was discovered at GFXBench, where the list of specifications revealed the presence of a processor of 1.5 GHz and eight cores, a screen of high definition of 4.7 inches, 2 GB of RAM, and internal memory of 8 GB. As for the camera, the phone comes with a 12 megapixel rear sensor and an 8 megapixel front. The operating system is Android 6.0.1 Marshmallow out of the box, and at the end of October received Bluetooth certification, and the December 1 also FCC certification. Finally, and in relation to the pending updates to Android 7.0 Nougat, in recent months Samsung has worked hard to bring the latest Android distribution to the top range of its devices, by activating the Galaxy Beta Program for the Samsung Galaxy S7 and S7 Edge, but many users are wondering when the company will update the mid-range devices to the new operating system. In the last hours, to try to give an answer in this sense, the Australian telephone operator Optus confirmed that Samsung has begun to test to bring Android 7.0 to the first variant of its Galaxy A5 in late January. 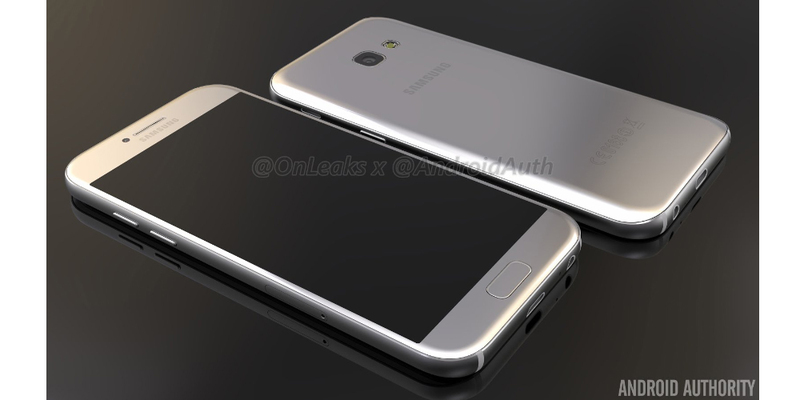 If everything goes as planned, the Galaxy A5 (2016) could become one of the compatible smartphones of the A series.